These polk-a-dot scarves were a signature look of the 1950’s. They can be worn with poodle skirts, by sock hop girls, or for “Grease” and the Pink Ladies. 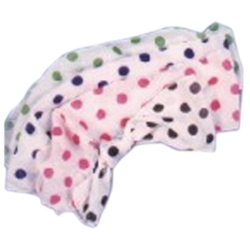 The 50’s polk-a-dot scarves are white with color polk-a-dots. Available in assorted colors.